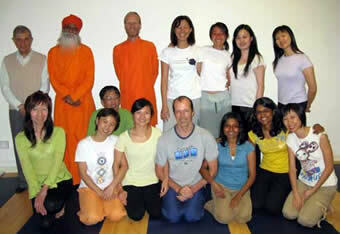 Yoga Academy of Singapore, began offering Diploma and Certificate courses in Yoga Science in January 2008. The first batch of 12 students graduated last December, and the second batch of 14 students are at present preparing their final thesis. The courses began with Dada Shambhushivananda calling me up, and asking my opinion about the fast developing yoga scene. I had always been of the opinion that Ananda Marga and Gurukula should make a strong effort to influence the fast growing and mainly physical approach to yoga and pull it in a more spiritual direction. After a couple of days, together we came up with the 10 modules the Course offers today. The one-year Diploma course has three semesters. Each semester lasts 12 weeks, and the students attend a three-hour session twice a week. In addition, there are about 10 weekends where they attend various workshops from 7am to 4pm. These weekends clearly make a deep impact on the students, as we focus more on meditation and spiritual development. Interestingly, much happens during the breakfast and lunch sessions. Eating together creates bonding, and as we have more time together they also get inspired for learning meditation. Many of them are now regular attending our weekly meditations. The course materials are pretty much based on the literature of Shrii Prabhat R. Sarkar, as well as on materials from various acaryas and members of Ananda Marga. We are at present working on developing textbooks for all the modules. In the first batch of students, half of them were members of Ananda Marga, but this year all the students have come either from our Yoga centre or from news paper advertisements. We are this year trying to have the school registered in Singapore by the Ministry of Education. If we succeed, it will provide a platform for us to set up similar courses in other countries. Now that the second batch of students is about to finish their Diploma course, I must say it has been a great pleasure and inspiration to see them evolve as yogis. Their spirit and luster after long sessions of asana, philosophy and meditation make them appear contented and confident, and I know they are ready to go out and do great service for the society. Lastly, I would like to highlight that these courses are not specifically designed for those who whish to become yoga teachers, but for anyone with a keen interest in the science and practices of yoga. This module aims to give a over view of the history of yoga. This is done partly through studying the biographies of famous yogis and yogic lineages and traditions. This module aims at giving students an introduction to Yoga Anatomy, Physiology and the various aspects of Bio-Psychology. In addition to studying the various asanas and their benefits, we go into depth about mind, mantra and meditation. This module aims to give a broad and deep understanding of Yoga and Tantra philosophy. This course aims to give the student a practical understanding and insight into the different aspect of yoga lifestyle, such as Astaunga Yoga, 16 points (along with Ananda Marga asanas, mudra and bhanda). What are the qualities of a good teacher? Here the students learn how to be confident, inspiring and responsible teachers. This module aims at providing knowledge of the evolution of yoga by studying classical yogic texts, including the ancient Bhagavat Giita, Patanjali’s yoga sutras, Astavakra Giita, and Shiva Samhita. This module aims at giving an understanding of how individual and collective life is closely interrelated. Through the study of Neohumanism and Prout, we understand how to live and act, and how to influence the movements of the society for the welfare of its members. This module aims at giving a theoretical and practical knowledge of Yogic treatments and naturopathy. Creative expressions add charm and beauty to life. Creativity is a mental process involving the generation of new ideas and concepts as well as associations between existing ideas or concepts. These ideas originate from the deeper layer of the mind, called atimanosa kosa, or the ‘causal mind’. Human desire for mental expansion and realization also originates in this layer of mind. By engaging oneself in creative expression through arts, music, dance etc, one’s atimanasa kosa develops. This module aims at providing the students opportunity for obtaining a deeper understanding of the practical aspects of yoga, yogic life and living, through an independent study.